As we gear up for the Big Bed Quilt-Along, are you working on selecting a pattern? Here are some very doable suggestions. Most were suggested by fellow quilt-along-ers! Sidewalk Chalk - This quilt has a cool improve look, but it's a pattern from Meghan of Then Came June. Pattern includes plans for a 90" x 104" bed quilt. 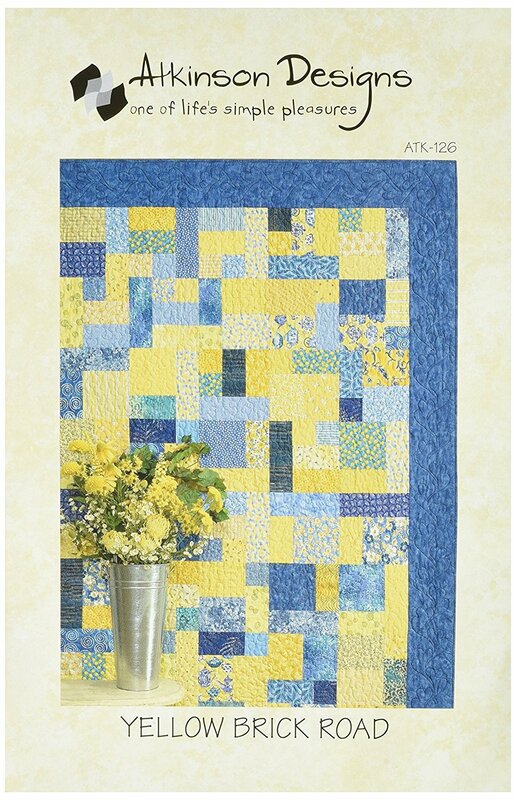 Yellow Brick Road - Robby says this one is great for a beginner, because there are no seams to match until joining blocks. Looks scrap-friendly to me! Includes directions for Queen - 93" x 102" and King - 120" x 120". Alternate Blocks - Some things don't require a pattern. Keep it simple by alternating a beginner-friendly block, such as this 16-patch, with a blank square. It'll build up to bed size quite quickly. Double Star Quilt - This pattern by Fancy Tiger Crafts would make such an impact on a bed. You can purchase the pattern or sign up for a Craftsy class, if you would benefit from more assistance. Pattern includes a 90" x 90" bed quilt. Add more borders to enlarge it as needed. Lake Cabin - Robby's considering this scrap-friendly pattern. It's not designed to be bed size, but enlarging is simply a matter of making more blocks and piecing larger sashing. The same size edge triangles will work for any version of this quilt. Coin Quilt - Here's another beginner-friendly quilt stye. It's sewn in rows of same-width fabric strips. Very scrap-friendly and easy-to-sew! I made two of these in twin-sized in 2012. Photo and quilt by Cassandra Ellis. Sashing - If your heart is set on a traditional square block such as a sawtooth star, churn dash or my Rosie block, don't forget to consider sashing. Adding sashing will bring your quilt up to bed size much faster than making additional blocks. Ditto for adding a wide border. Diabolical Jane - This stunning quilt is available as a free tutorial by Jessie Aller. It yields a 102" quilt when 9.5" borders are added. This is more of an intermediate quilt, but I had to include it because it's so different and would be fantastic on a bed. Plus, it seems to me that it would go together quickly! Photo and Quilt by Jessie Aller. This very quilt happens to be hanging in my sewing studio, here for longarm quilting services. Hoorah! Now I already have a big bed quilt in process and can't be allowed to start another, but this list has me tempted! I think I'd have to fall for Diabolical Jane myself. But let's not be dissuaded, friends, from our current goals. These tempting new pattern ideas will have to stew. Their time will come! This post is part of a series: the Big Bed Quilt-Along. We're sewing along February - April 2018, but you can use the resources anytime to help you make a large quilt. Go here for links to all posts and use hashtag #BigBedQAL to share your progress!